Denise Minger wrote a very thought provoking post on the very low fat Pritikin Diet and how it can help reduce disease including diabetes and cancer. In the first part, I wrote my thoughts on the Kempner Rice diet here. The Pritikin diet is primarily composed of high fibre, high carbohydrate, low-fat, plant based foods. With his close relationship to McGovern, this diet formed the basis of many of the low-fat, carbohydrate based recommendations of the 1977 Dietary Guidelines for Americans. Over some decades, his colleague RJ Barnard published many studies on this diet and how it could reduce many different diseases – mostly those associated with the metabolic syndrome. For example, this diet could help reduce prostate cancer, reduce insulin and medication usage for type 2 diabetes, reduce LDL oxidation, reduce breast cancer, reduce colon cancer, reduce heart disease, and improve cardiac risk factors. Furthermore, there are many traditional societies that ate a similarly ultra low fat, whole, unprocessed vegetable based diet that had low incidence of all these diseases. The Okinawans and the Kitavans come to mind quickly.These are many of the same benefits that low carbohydrate diets also claim. How can very low fat diets have the same benefits as very low carbohydrate diets? Perhaps there are, as Denise suggest, two different kinds of ‘magic’ going on? 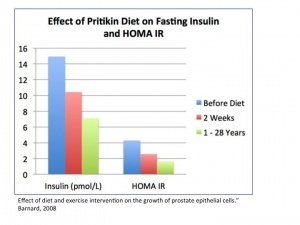 The Pritikin results are clearly at odds with the Carbohydrate-Insulin Hypothesis (CIH) which holds that high carbohydrate diets result in high insulin and therefore obesity, T2D, and the rest of the metabolic syndrome. High carbohydrate diets should have the opposite effect as high fat diets. So, is Denise right? Does the Pritikin diet have some ‘magic’? Here’s a surprise. I almost completely agree with Denise. The answer is this. Macronutrients, just as with calories is the wrong measure of a diet. This is nutritionism’s greatest blunder. This refers to the fact that trying to reduce the complexity of foods and their effect on humans to some mix of macronutrients (fat, protein and carbs) is completely wrong. The CIH, depicted above, as it stands is clearly inadequate. There are too many inconsistencies, which I’ve written about in a previous post – unimaginatively titled “The Carbohydrate-Insulin Hypothesis is Wrong“. The Asian diet of the 1990s for example were very high in carbohydrates, but did not lead to obesity. The main problem with the CIH is that it does not take into account the multiple factors that lead to an increased insulin level (you can review my 50ish posts of the Calories/ Hormonal Obesity series for more background). Increased insulin leads to obesity and the metabolic syndrome. And sure, refined carbs lead to increased insulin, but they are not the only things that do so. This sort of simplistic theory does not account for, among other things, the deadly effect of fructose, the time dependency of insulin resistance, animal protein, fibre, vinegar and fermentation effects, or dietary fat. CIH pretends that the only thing that matters is the amount of carbohydrates. So it’s wrong. But it’s not really incorrect, so much as incomplete. Yes, carbohydrates are a big part of increasing insulin, but they are not the only part. 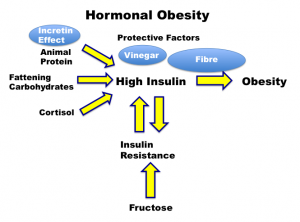 A more complete version would look like this – the Hormonal Theory of Obesity. Notice that insulin is still at the core, but there are many inputs and protective factors – only one of which is carbohydrates. There are many things that raise insulin and many things that also lower insulin. The CIH was too simplistic, and therefore, incorrect. In addition, the use of macronutrients instead of foods complicates things significantly. Not all carbohydrates are the same, just as not all fat or proteins are the same. For example, the amylopectin (a type of carbohydrate) produces vastly different effects depending on whether it comes from wheat or from beans. Amylopectin A is not the same as Amylopectin C. You can see this effect in the Glycemic Index. Carbohydrates are not all equal. Unprocessed, whole carbohydrates, yes even boiled potatoes have a much, much smaller effect on glycemic load than processed carbs like cornflakes. For carbohydrate foods, there is a close correlation between GL and insulin secretion. 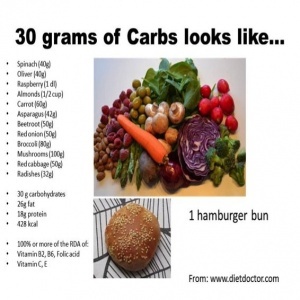 So 30 grams of carbohydrates can either be the most healthy looking lunch you’ve ever seen, or 1 hamburger bun. So focusing simply on macronutrients, whether fat, protein, or carbs is simply wrong. We need to talk about foods, not macronutrients. So, looking at the more complete Hormonal Obesity Theory (HOT), you can see that insulin is what drives obesity, but carbohydrates are not necessarily what drives insulin. Non-caloric, non carbohydrate factors such as cortisol (stress) can also play a big role in insulin and weight gain. If a high fibre, high unrefined carbohydrate, diet lowers insulin, then we should expect all the benefits of reduced weight and reduction in all of the manifestations of hyperinsulinemia – Type 2 Diabetes, Hypertension, heart disease etc. If a Low Carb High Fat diet also lowers insulin, then we should see all the same results. And guess what? I don’t really care if you eat LCHF or Pritikin – as long as those insulin levels come down, I don’t care. Why? Because you will derive the same health benefits of lowering insulin. This will be highly beneficial in all the diseases of high insulin (metabolic syndrome). In other words, we need to evolve from a carbohydrate centric view of obesity (CIH) to an insulin-centric view of obesity (HOT). So let’s look closer at the Pritikin diet, and others based on it, like the Ma-Pi diet. Insulin goes down. A lot. Even though carbohydrate consumption is high. Why? Well, the Hormonal Obesity Theory explains why. 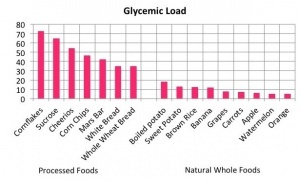 The carbohydrates being eaten are whole unprocessed ones which do not increase insulin as much (low glycemic load). There is little to no fructose. There is lots of fibre (protective). There is less animal protein (insulinogenic). This is not a high insulin diet! It lowers insulin. Therefore, I would expect that it lowers weight and the rest of the metabolic syndrome as well. And that’s exactly what Pritikin, as well as Neal Barnard and others have shown. Obesity, T2D, and the rest of the metabolic syndrome are simply different manifestations of hyperinsulinemia (too much insulin). Therefore, any diet that lowers insulin will show incredible benefits. This includes the Pritikin Diet as well as the LCHF and Paleo and Atkins diets. Forget about macronutrient composition of diets. I’ve always tried to stress one point – The toxicity lies in the processing, not the macronutrient composition. You could even live in the macronutrient swampland and do well. But you must keep insulin levels low. So, I do disagree on one semantic point with Denise. I don’t think there are two types of ‘magic’ here. There is only one type of ‘magic’ – lowering insulin results in benefits in a high insulin disease state. But there are two different ways to get there. Both Pritikin and LCHF work fine. Actually – there are multiple ways to get there – Mediterranean, potatoe diet, Zone Diet, Weight Watchers etc. Can you eat a high carb diet and still have low insulin? Of course. Because carbohydrates are not the only stimulus to insulin. The Kitavans – a traditional Pacific Island society demonstrate this perfectly. 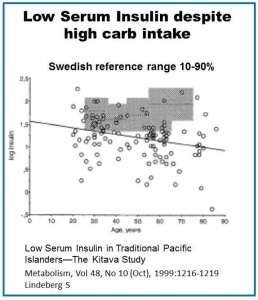 Eating a diet that is estimated at 70% carbohydrate – unprocessed, whole foods with almost no sugar, the Kitavans maintained a serum insulin level lower than 90% of a typical Swedish person. We need to move forward from the failed ‘Calories causes Obesity’ paradigm. But just as surely, we need to move forward from the failed ‘Carbohydrates causes Obesity’ paradigm. Let’s face the facts head on. We’ve done Atkins. It was not the effortless weight loss promised. The underlying Carbohydrate-Insulin Hypothesis was woefully incomplete. But the Insulin Hypothesis is still intact. Obesity is a hormonal, not a caloric imbalance. But carbohydrates was not the entire story. There is so much more – stress, and sleep, and cortisol, and protein, and fibre, and fat, and fructose, and insulin resistance and vinegar, and fermentation, and the incretin effect. Forget macronutrient content. It’s not the Fat. It’s not the Carbs. It’s not the Calories. As my friend Amy Berger of TuitNutrition says, It’s the Insulin, stupid! GL of grapes is 11.
better gauge of food’s effect is glycemic index. Without re-working the math, I would guess that Dr. Fung adjusted the load data according to a constant weight of the items he graphed, instead of the “serving size” as reported on the site at the link you posted. So he may be reporting glycemic load per 100 g.
On the site you link, the serving sizes vary by quite a bit. E.g., the white bread serving size is 30 g, but the grapes serving size is 120 g.
any food eaten. Therefore, completely meaningless. You are back engineering the load to the index. Thank you for this! I hadn’t seen it before. Very useful. — for explaining so many metabolic issues with such clarity! No doubt you have already planned your future posts. You and Minger both mention the issue of oxidized LDL as related to diet. I hope that sometime you can address the dietary and metabolic factors that are involved in that oxidation, as well as in raising serum Apo B or LDL particle numbers. In other words, add to the story about diet patterns and atherosclerosis, body fat, and diabetes. Perhaps I have missed or forgotten what you have already posted about these issues. I find Peter Dobromylskyj’s posts on Denise Minger’s startling findings the most cogent. Try high-fat-nutrition.blogspot.com on October 10th and 14th, 2015. Awesome post and insights, Dr. Fung! Jason, thanks for your recent calm commentaries on what Denise has invited us to think about, for pointing to what factors are at play. I was happy with the way Denise set about prodding us to think anew, but was quite surprised at the blunt and dismissive rejections put out by some well-known contributors to the “Paleo/ LCHF / Insulin /Real food” conversation. It was scary to see how quickly some apparently thoughtful, progressive people could jump overboard in their haste to write-off an invitation to think. This explains why the weight I lost at 35 (eating cheaply with whole foods from all over the spectrum) was a whole lot easier to lose than the weight I lost post-menopausal (with LCHF and fasting)–INSULIN! I wasn’t nearly as resistant then as I am now. Dr. Jason Fung: Absolutely. 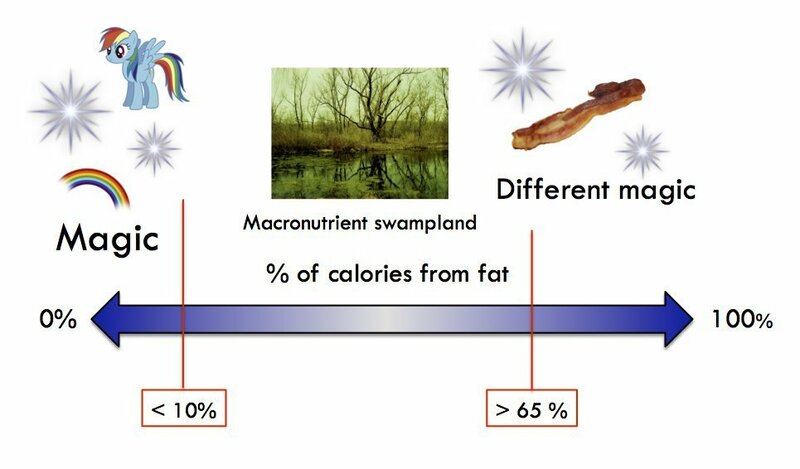 This is the time-dependence of obesity, which everybody intuitively knows, but is not explained by either the Calorie paradigm or the Carbohydrate paradigm. How come glycemic load of white bread and whole wheat bread are equal if the added fibers are “protective”? At least I get a much longer period of satiety by eating whole-grain bread (which I don’t either any more in principle, but…) compared to white bread. Personally, I think stress has an incredible amount to do with it, particularly for heart disease. There is probably at least some degree of genetic influence. There are plenty of groups that *don’t* do well on high amounts of refined grains. I think it would serve everyone well to go back and reread Protein Power. It has a good discussion of insulin and the effects of carbs, protein, fat, and their various combinations on insulin levels as well as glucagon levels. A very recent study underlines Dr Fung’s hypothesis that sugar is much more harmful than other carbohydrates. All markers of metabolic syndrome were reduced in as little as nine days, and insulin by a third. Note that the benefit occurred even though simple sugars were replaced by bread, bagels, etc.! Thanks for the last two post Dr. Fung. The calories in, calories out theory is like a broken clock. It is right twice a day. The CICO theory is right only when the foods your are currently eating work well with your metabolism at that moment in time. But if your food or metabolism change, then metabolic disease will follow. However, the hormonal theory is right all of the time and thus encompasses the CICO. BTW, the CIH may be soooo 2010 for Dr. Fung. But for me it is soooo October, 2015. My new campaign slogan is It’s The Insulin, Stupid. Thanks, Amy. As a T2DM, I do better on a LCHF (Atkins-like) diet vs a high fiber, high carb, low fat (Pritikin-like) diet. My LCHF diet still has lots of fiber due to the judicious use of 1/2 cup of beans and an avocado or two per day. In addition, I eat 4 servings of green vegetables per day. The above link is interesting. The writer (you should read *all* his posts!) kicks around some ideas about the metabolic “magic” which may be going on under extreme low-fat. Be aware the first part of the post is very heavy with cellar biology and biochemistry. You can skip that to get to the end conclusions, which I think are a reasonable response to the study that Minger is looking at.